In addition to linemen keeping the power flowing, Blue Ridge Energy Propane and Fuels division made deliveries today to help keep homes warm. 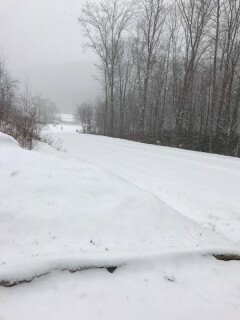 A Watauga propane supervisor took this photo of road conditions early Friday. Snow blanketed the Blue Ridge Energy service area today but outages were limited. With snow continuing tonight and into tomorrow in some locations, Blue Ridge Energy employees remain on high alert and ready to respond if needed. • 154 members in the Caldwell County communities of Globe Road, Rocky Knob, Cone Orchard, Green Mountain Park, and Draco Road. Equipment failure and an accidental cut to the cooperative’s underground lines were the cause. • 32 members in the Edgemont community of Watauga County. Linemen are investigating the cause as they work to restore power this afternoon. • 13 members in the Hickory Ridge Road area of Ashe County were impacted by a tree on power lines. Members can report outages by one of two options: the Blue Ridge mobile app available free in app stores or by calling PowerLine: 1-800-448-2383. A live outage map showing estimated restoration times and current outages is available on the mobile app and online at www.BlueRidgeEnergy.com.